More than 1 billion people on the planet are at risk of bacterial illnesses such as dysentery, typhoid, and cholera due to a lack of clean, sanitary drinking water. The United Nations has declared 2013 the “International Year of Water Cooperation,” and a new water filter developed in Sweden holds the potential to have a large impact on this global issue. Solvatten, a solar energy water purifier, uses ultraviolet light gathered from sunshine to kill microorganisms in water, purifying up to 11 liters in 2-6 hours, two to three times per day. This is a potentially revolutionary innovation in water filtration, and the creators believe it may have the ability to provide clean, fresh drinking water to the nearly one-sixth of the population in need of it. The design is made of two 5-liter compartments with transparent faces. When exposed to the sun, the water inside is heated to 130 degrees Fahrenheit, which kills pathogens that cause disease. The team showed off the device at the World Water Week convention, which brought it plenty of recognition. 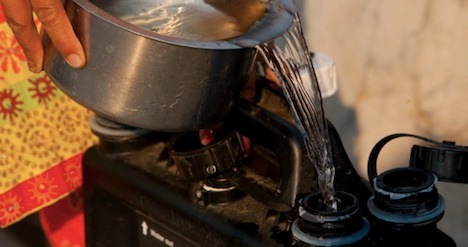 The Nordic Environment Ministers NDF and local NGOs have teamed up with Solvatten to distribute filters to 13,000 people in Kenya, who will save $150 to $250 per year on energy. Mass deforestation has caused charcoal supply to diminish and energy costs to skyrocket there. Families will save time and money while enjoying clean water and conserving precious resources. As if this story couldn’t get sweeter, the Nordic Environment Ministers NDF and local NGOs are offering “climate benefit” credits that make Solvatten affordable and attainable for residents. This sounds like a genuinely good product that could well have a huge impact on the health and livelihood of many people across continents. It will be a wonderful day when one of the most important resources on the planet is no longer an unattainable resource to anyone. There have been many companies coming out with revolutionary technologies that are going to change the world, but they haven’t solved the problems. Water purification systems are needed in these countries, however, they still cannot afford these types of systems, and unless they are supplied at a fraction of the actual cost, there will never be a solution. Sure, and often it’s a repair and replacement issue. When they eventually break down, or need to be supplied with new materials, those have to be inexpensive, and locally available.